The E-Patrol Robotic Sheriff could fill that bill. It is among several security robots that have shown up at train stations and airports around China in recent months. The E-Patrol Robotic Sheriff — which looks like the camera lens from the HAL 9000 computer in “2001: A Space Odyssey” mounted on a white trash tub — patrols the high-speed rail station in the central Chinese city Zhengzhou, tasked with using facial recognition to find and follow suspicious characters, as well as to measure air quality and detect fires. During a winter visit to the station, the robot was nowhere to be found. First, it had missed a fire, officials said. It also had a tendency to collect so many selfie-seeking fans that it became a safety hazard. A spokesman for the train station said it was getting an upgrade and would eventually return. Robots in particular have captured the Chinese imagination. A Beijing television station this year made a robot-dominated version of the country’s annual Lunar New Year television special. Robots and humans performed tai chi and comedy routines, and sang and danced. Companies and local officials often have good reason to show off their splashiest and silliest wares. China frequently takes a top-down approach to technology, with local governments rushing to follow plans that come down from on high. Gizmos with a bit of futuristic verve are often the best symbols of progress. Dancing robots, for example, became something of a fixture of company and government presentations last year. “They were everywhere,” said David Li, a co-founder of Shenzhen Open Innovation Lab, a government-supported platform that supports small hardware start-ups in Shenzhen. He estimated that he had seen 10 dancing robot shows in a single week. Alibaba, the Chinese online shopping giant, has also gotten into the act, though in a more sophisticated way. At one of its new Hema grocery stores in Shanghai, rolling robots take cooked food out onto a sort of runway that connects the kitchen to seating. 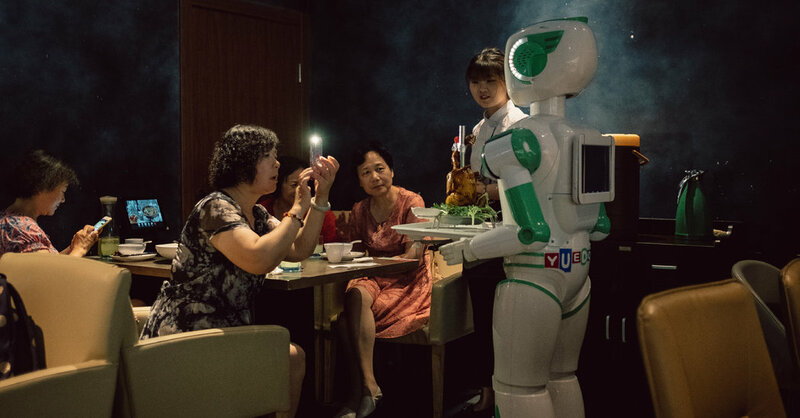 A team of waiters standing nearby said a human hand was required for soup and steamed dishes, lest the robots inadvertently splash someone with hot liquid.